One of my favorite designers is Laura Patterson of Fiber Dreams. I love how her designs are both classic and feminine. And I was really pleased when she agreed to be included in my GAL Designer Interview series. I know you’ll find her as interesting a person as I do…..
My grandmother taught me to knit when I was a child. I was staying over night with her, and honestly, I think she did it to keep me busy, quiet, and out of her hair. Anyway, Grandma taught me to cast on and to knit. That’s it. Mom remembered how to cast off, so she showed me that. With these three skills, I proceeded to knit what must have been the world’s ugliest sweater with yarn Mom had gotten for me at the grocery store. It was variegated, and went from white to dark green, with a variety of heinous shade of green in between. I used it to knit a cardigan-style vest that closed with a crochet chain and two huge pompoms. It was ghastly. I had no idea about shaping, style, anything. It was a small miracle it even vaguely looked like a garment. Mom threw it away before I started designing, or I’d share a picture of it. About fifteen years after that I finally took a couple of knitting classes at a LYS with friends, where I learned how to purl, work simple lace, and do some basic shaping. It was fun. I was hooked. I’ve been knitting off and on ever since. My husband is the one who got me to design in the first place. He watched me knit from other people’s patterns, and remarked that I never could completely follow one as written. I’d change a neckline here, add pockets there, re-work the math to match the gauge I got… If it weren’t for him I don’t know how long it would have been before I took the next step into design. But he was there, encouraging me to try, and since 2007 I’ve been designing non-stop. My husband and I met 22 years ago. We had signed up for the same class on a yacht in Hawaii. We were introduced at the airport on Kona, and it was love at first sight. We stayed on a live-aboard dive yacht, and floated around the Kona coast for a week while learning to SCUBA dive. He lived in southern California at the time, and I lived in San Francisco, 400 miles north. We did the long distance thing for about 1-1/2 years until I was able to get a job in southern California. We’ve been together ever since. Our only child is our aging orange tabby cat, Miss Rickie. How did you get started selling your designs? I did that from almost the very beginning. Ravelry wasn’t around yet, so I sold my patterns on my blog. I sold some patterns, South Seas Stole did especially well, then I was looking for a sample knitter in December. 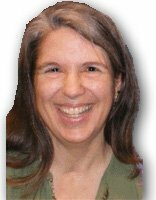 Wendy Johnson volunteered to help me out, and she blogged about it. The rest, as they say, is history. What do you see as your design style? When I was growing up, purchasing clothes was always a challenge. I was always tall for my age (though not tall enough for the “tall” clothing lines), and stick thin, meaning that sleeves and pants were always too short if they fit my thin frame, or if they were long enough they’d fall off for being so large in the body. If that wasn’t bad enough, Mom and I always butted heads about style. I always wanted clothes that were more feminine, and things that were actually in style that year. She wanted me to wear plain, simple clothes that I found either boring or downright ugly. When I grew up and moved away, and finally got to shop on my own, I found that she was right about one thing: in order to last from season to season, or year to year, clothes need to be simple, classic in style. I never really liked wearing logo t-shirts, or things with a riot of wild colors, so I’ve been mostly stuck with simple, solid colored clothes. The clothes that have made me feel best when I wear them have had simple, classic lines, swirling skirts, and feminine details: a little lace here, maybe a few beads there, waist shaping, proper fit, things that can make a basic tee-shirt into a lovely little top that can be worn more than one season. These are the ideas that I bring to my design. Classic lines that follow the female form, a little lace, some beads… Take Lalique. The shape is basic and simple: cropped length, and so no waist shaping, 3/4-length sleeves, a simple scooped neckline. When you throw a trio of lace stitches and a few beads at the form, it becomes something uniquely feminine, easily turning basic tops and dresses into romantic outfits. Weather, mood, what I’ve knit lately, what I *haven’t* knit lately, and whim. What do you enjoy most about designing? I worked for years in a high tech job that just had the middle. I never had the beginning or end to anything. It was frustrating. The very best thing about knitwear design is having a very clear beginning, middle, and end to every project. Do you have any projects coming up that you can share or give us a sneak peek of? Um. Not really. Not at the moment. Oh, wait! Yes, I do. There’s a shawl design that’s currently in time out, waiting for me to figure out where to go next with it… after I finish up a couple of secret projects. 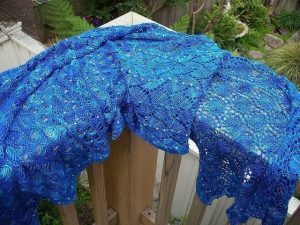 The shawl has a sea theme with a number of different stitches. I’m knitting it out of the lovely Black Pearl from Yarn Sisters. This yarn is dreamy. I’m really looking forward to being able to sit down with it again, figure out what’s wrong, and finish it up. With luck (ha ha ha) I’ll have time to do this before the end of the year. Do you get to do much knitting for yourself? The answer is both yes and no. Yes, I do get to do some knitting for myself, but I always design the projects, and sell the resulting patterns. No, these days I never knit other people’s patterns. What prompted you to join the Indie Design Gift A-Long on Ravelry? How could I not? I simply had to be a part of something this big, this innovative, this fun. Has the GAL met your expectations? 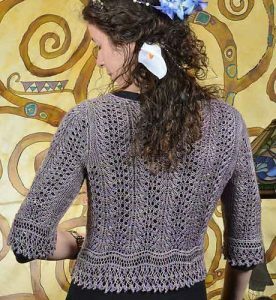 The initial sale was fabulous (Lalique was the runaway best seller, with Cirrhosa and Birdsfoot Fern tying for second place), but I haven’t seen a single project done with one of my patterns yet. That part is kind of disappointing, especially since most of the designs I chose for the GAL knit up reasonably quickly. Would you like to see the GAL become an annual event? Where can folks find your designs? 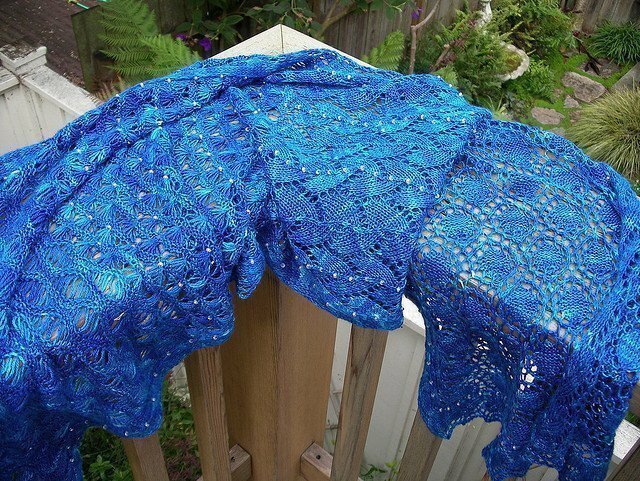 I sell PDFs of my patterns on Ravelry, of course, as well as on Patternfish. Primarily, though, my printed patterns are sold in yarn shops throughout the U.S. and Canada. I’d like to thank Laura for taking time from her designing to share something of herself with us ~ it was very enjoyable to interview her.